The magnificent Krka River - Explore Croatia Become a Patron! Where Krčić River ends in a spectacular rainbow-adorned waterfall, the Krka River is born, springing from the underground cave. You ain’t seen nothing yet, this is just the beginning! 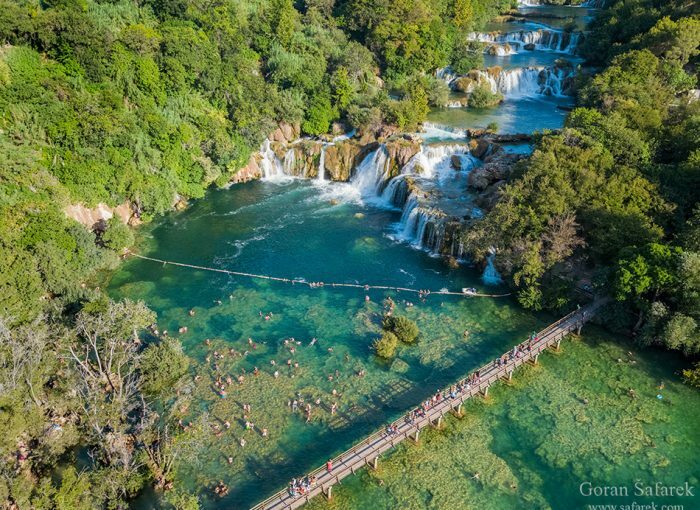 First, The Krka flows through picturesque karst plain, cold and transparent, but the magic happens when it enters the monster canyon. If that was not enough, big tufa barriers have dammed the river, making magnificent waterfalls and cascades, one more beautiful than another. It culminates with the Skradinski buk, the longest waterfall in Europe, made up of many smaller cascades. First a maze of emerald-green, fish-filled river lakes, connected by smaller falls and rapids, then an 800m-long cascade that descends by almost 46m before crashing into the estuary. Then it flows toward sea near Šibenik. The Krka River is a mixture of the Mediterranean fragrances, the mixture of the sea and freshwater, the freshness in a hot day and age-old watermills – the famous picture from the postcards, true highlight of every vacation on the Adriatic coast. Krka waterfalls are on the list of the most beautiful Croatian waterfalls. The Krka is a river in Dalmatia that springs in Knin, and meets the sea near the town of Šibenik. It flows through gentle karst plain, then through spectacular canyon and it culminates with the Skradinski buk, the longest waterfall in Europe, made up of many smaller cascades. It was declared a national park in 1985. There are several popular spots on its course. The waterfalls are the main attractions with a good infrastructure: Manojlovački buk, Bilušića buk, Roški slap and Skradinski buk. There are cultural attractions too, like the remains of the Roman camcalled Burnum near Manojlovački buk. The nearest towns are Šibenik, the major tourist centre in this par tof the coast, Skradin, lovely old town with a marina, Drniš in the middle of the karts plain and Knin. There are many possible accommodations, around the park. The entrance ticket price for 2018 is 200kn for adults, 145kn after 4pm, children above the age of 7 is 120/90, while younger are free. As everywhere on the Adriatic coast, the summer ina high season and the crowds are inevitable. If you can, visit the park in the spring. The falls will also look better, and the temperature are more comfortable. Swimming is not allowed in the river, but it is under Skradinski buk, the biggest and last waterfall. Te priocess of the food and beverages are extremely high (simple ćevapi around 12€), so try eating before or later.